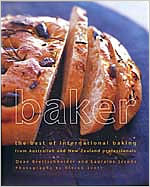 Winner of the Best Bread Book - English award at the Gourmand World Cookbook Awards 2001. Rick Stein, The Seafood Restaurant, Padstow, Cornwall, England. This book presents everything the home baker, professional baker or chef needs to know about breads, cakes and pastries. The reference section provides comprehensive information on basic principled, ingredients, techniques, equipment and formulas and gives the reader a thorough understanding of how and why baking works. The recipe section is made up of the best recipes from the best bakeries in Australia and New Zealand. This brilliant range of baking includes the new and innovative as well as traditional recipes. Dean Brettschneider is a professional baker and patissier with an international following. Known internationally as "the New Zealand Baker", Dean is a professional bakery adviser, widely respected as a skilled and innovative craftsman. Working in Asia, the USA, Britain and Europe as well as in New Zealand, Dean has earned many accolades and awards in bakery competitions and exhibitions. Random House New Zealand is New Zealand's pre-eminent publishing company, with a reputation for excellence in all aspects of their business. Random has a strong commitment to publishing New Zealand books for the New Zealand market, and for the last five years has been voted New Zealand Publisher of the Year by booksellers.